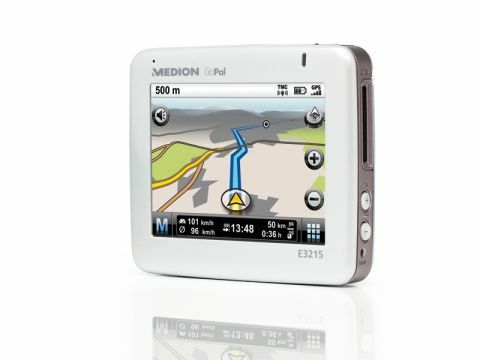 The Medion GoPal E3215 Glamour Edition (£130 inc. VAT) is a sat nav system designed with women in mind. As such, it's ﬁnished in white and metallic pink and comes with a pink satin-look case. Also included in the box is a solidly constructed, but ﬂexible windscreen mount and a USB and in-car cigarette lighter. At 17mm in depth, the unit is very thin and light and easily fits into a pocket or handbag when not in use. The device works straight out of the box, and the user interface is highly intuitive and made very easy to use by the 3.5-inch screen and simple symbol buttons. Destination entry is simple and a predictive keyboard feature ensures you are typing correctly. Routes are clear, and it is possible to switch instantly between 2D and 3D map views. If you do stray off the suggested route, the GoPal quickly redirects you. Amongst the more useful features are the location of speed camera warnings, as well as displaying traffic information to plan an uncongested route. A basic travel guide function displays places to eat, petrol stations and Points of Interest (POI). The GoPal only comes pre-loaded with maps covering Britain, Belgium and The Netherlands, but maps covering other Western European countries can be purchased and added via SD card. Minor complaints that could be levelled at the GoPal include a touchscreen that is prone to ﬁngerprints, and the display could also be a little brighter. Bluetooth connectivity and more extensive mapping are cost options. The Medion GoPal is well priced and is a good entry-level sat-nav. Overall, it's an attractive unit and Medion is hoping the colouring will help to make it appealing to women. Mac users will be disappointed to learn the supplied software is only compatible with Windows-based laptops and PCs, however.